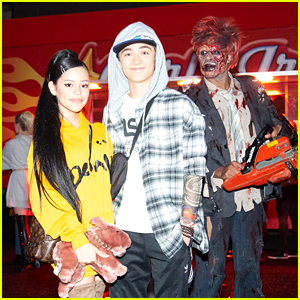 Jenna Ortega & Asher Angel Dress as Ariana Grande & Pete Davidson at Just Jared's Halloween Party! Jenna Ortega and Asher Angel make such a cute couple while attending the 2018 Just Jared Halloween Party presented by Carl’s Jr. at Goya Studios on Saturday (October 27) in Hollywood. The 16-year-old Stuck in the Middle actress and the 16-year-old Shazam actor dressed up as former engaged couple Ariana Grande and Pete Davidson. Jenna and Asher told us that they planned their costume weeks ago, before the couple decided to end their engagement. Since they had the outfits already planned, they decided to stick with the idea anyways! The two young stars met up with their friend Landry Bender inside the party. She was dressed as the Black Swan. Guests were well-fed at the event thanks to Carl’s Jr. The menu included the Famous Star burger, crisscut fries, and fried zucchini. The food truck had a line the entire night! Sarah Hyland and Jesse Tyler Ferguson are doing their part to put a stop to childhood hunger! The Modern Family co-stars joined forces at the No Kid Hungry Dinner held at a private residence on Friday (October 26) in the Brentwood neighborhood of Los Angeles. They were joined by Ayesha Curry, Skai Jackson, Cailee Spaeny, Landry Bender, and Hannah Hart. 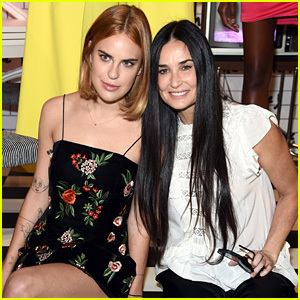 Demi Moore poses for a photo with her daughter Scout Willis while attending the alice + olivia by Stacey Bendet fashion show held during New York Fashion Week on Tuesday (September 12) in New York City. The 54-year-old actress’ daughter Tallulah Willis also was in attendance and they all met up with designer Stacey Bendet. 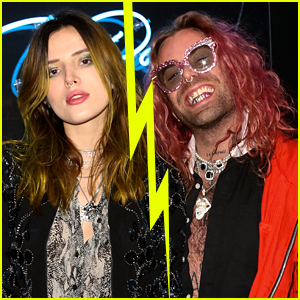 Some of the other stars who were at the show included Paris Hilton and Nicky Hilton, Victoria Justice, India de Beaufort, social star Eva Gutowski, and Disney Channel stars Skai Jackson and Landry Bender. “coffee with the gals,” Tallulah captioned the below Instagram pic from the show. Simone Biles poses alongside her teammate Aly Raisman while attending the Sherri Hill fashion show during 2016 New York Fashion Week on Monday (September 12) at Gotham Hall in New York City. 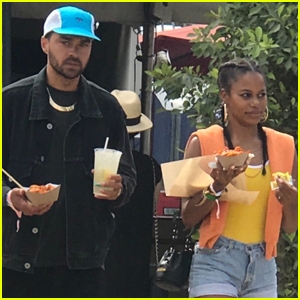 The Olympic duo was joined at the event by Alli Simpson, Jordyn Jones, Landry Bender, Ireland Baldwin as well as Sadie Robertson, who walked in the show. After the show, Aly took to her Instagram to share a sweet photo with the mini models who walked the runway. “They stole the show!! !” she captioned the cute pic. Landry Bender looks chic in her white blazer and jeans while attending the Just Jared Jr. presents the Disney Mix Launch Party on Friday (August 19) at The Greenhouse at Platform in Culver City, Calif. The 16-year-old Best Friends Whenever actress was joined at the event by a ton of other Disney Channel stars, including her co-star Gus Kamp, A.N.T. Farm‘s Sierra McCormick, Disney XD’s Gamer’s Guide to Pretty Much Everything‘s Sophie Reynolds and Felix Avitia, Bunk’d‘s Karan Brar and Nathan Arenas, I Didn’t Do It‘s Sarah Gilman, Liv and Maddie‘s Chloe East and Tenzing Norgay Trainor, KC Undercover‘s Trinitee Stokes, and Walk the Prank‘s Brandon Severs. The party was held to celebrate the launch of the new app, Disney Mix, which is a social messaging/chat app where you can chat, share, and play with friends for free. Pregnant Christy Carlson Romano Debuts Baby Bump at 'Adventures in Babysitting' Premiere! Christy Carlson Romano places her hand on her baby bump while walking the carpet at the Adventures in Babysitting premiere held at the DGA Theater on Thursday (June 23) in Los Angeles. The 32-year-old pregnant actress, who just announced that she is expecting her first child, starred in several Disney Channel shows and movies throughout her career! Dove Cameron was there to support her Descendants co-star Sofia Carson while Rowan Blanchard and Peyton Meyer attended to show love to their Girl Meets World co-star Sabrina Carpenter. Other stars in attendance included High School Musical‘s Monique Coleman, Teen Beach Movie‘s Garrett Clayton, John DeLuca, Chrissie Fit, and Mollee Gray, The Cheetah Girls‘ Sabrina Bryan, Best Friends Whenever‘s Landry Bender, Lab Rats: Elite Force‘s Paris Berelc and Kelli Berglund, and StarStruck‘s Sterling Knight.